A universal translator with Cubert and Farnsworth (2ACV10). 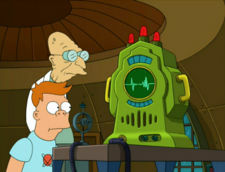 The universal translator is an invention by Professor Hubert J. Farnsworth. While, initially, it only translated into an incomprehensible dead language (2ACV10), it can now translate to and from the Carcaron language (7ACV05). A universal translator with Zapp and Kif (7ACV05). 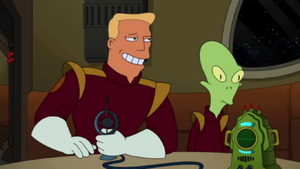 Universal translator: I'd like to spank your sister with a slice of baloney. In the French dub the translation is into German ("Guten Tag."). This page was last edited on 30 June 2013, at 22:21.